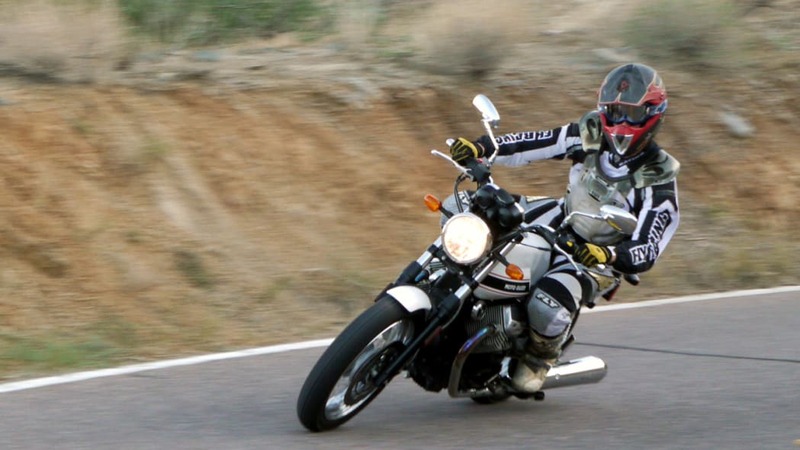 Every once in a while, you can tell exactly how a motorcycle will ride based solely on the initial walkaround. 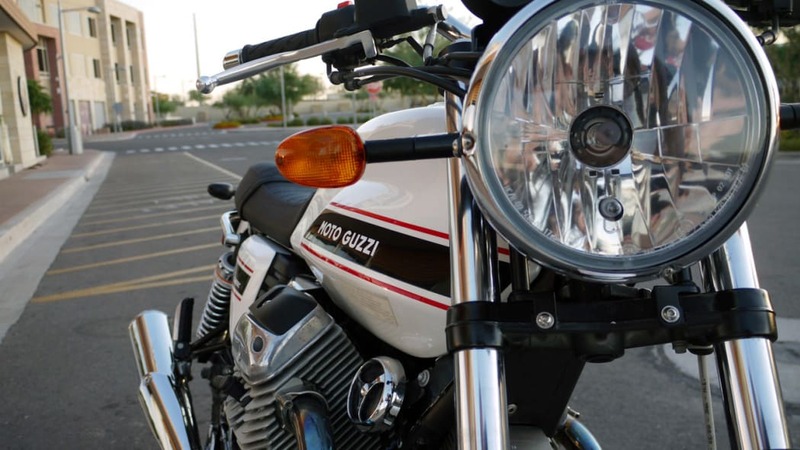 When the seminal Yamaha VMax hit the scene way back in 1985, one look at its muscular stance, massive V-four and spindly suspenders told you everything you needed to know about its intentions. At the other end of the spectrum, it takes just a quick glance at any modern Vespa to know if its rider is destined to be a mod or a rocker. 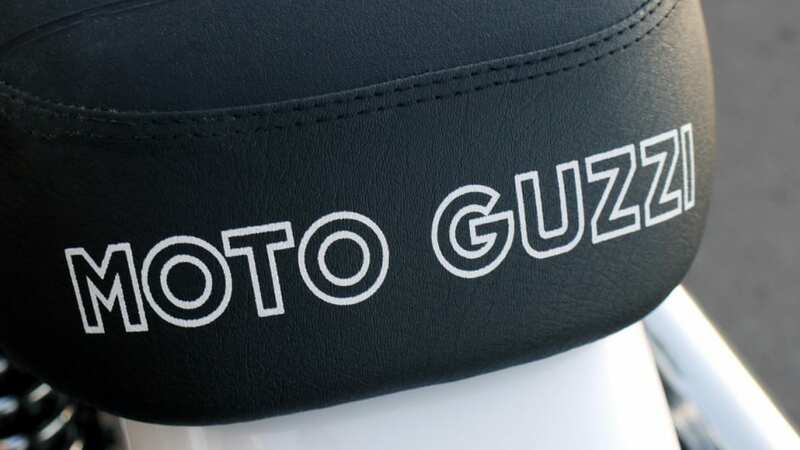 This odd ability to instantaneously assess a bike's virtues came again when the Moto Guzzi V7 Classic arrived on our doorstep. As you'd expect, we dove right into the nitty-gritty details as quickly as we could type its name into Google. We dissected the manual and gazed at the pictures. Then we went outside with the key clutched firmly in hand, approached the machine and promptly forgot everything we'd just spent the last few hours reading. With a bike like this, the spec sheet seems largely irrelevant and mundane; things like horsepower and torque figures really don't seem to matter. How can that be? Click past the break to find out. Photos copyright ©2009 Jeremy Korzeniewski / Weblogs, Inc. 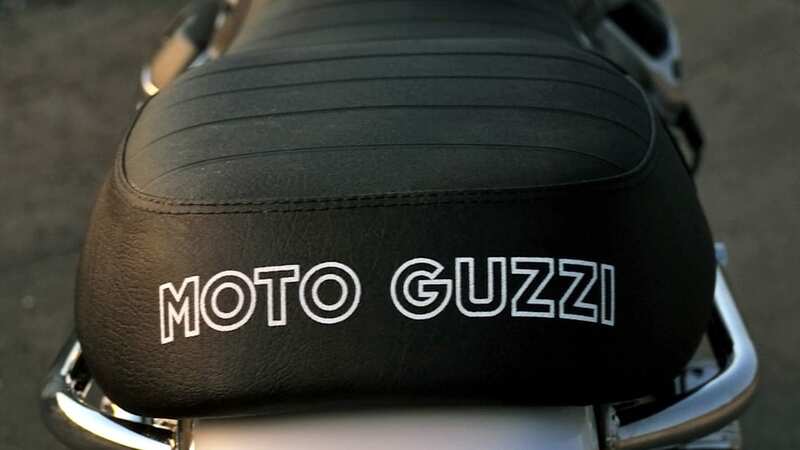 When we first approached the V7 Classic, the first thought that popped into our head was that Guzzi had produced a traditional UJM – that is, the Universal Japanese Motorcycle. 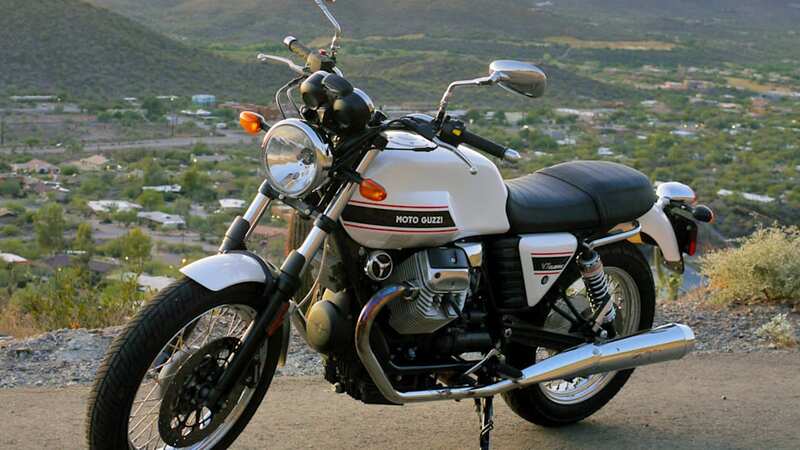 Oddly enough, the big four Japanese manufacturers seem to have largely ignored the bikes that built their storied reputations, and that's a shame. 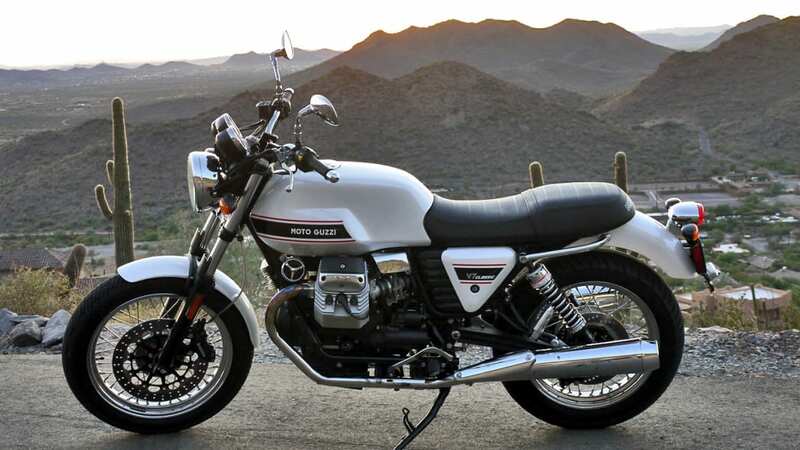 These days, the motorcycle marketplace can be divided into dozens of individual niches, and while that means there are more choices than ever when trying to find the perfect bike for a specific mission, it also means that it's really tough to choose just one motorcycle with which to commute to work, run errands and enjoy on the weekends. This was the domain of the UJM, perhaps best exemplified by the first Honda CB750 from 1969. 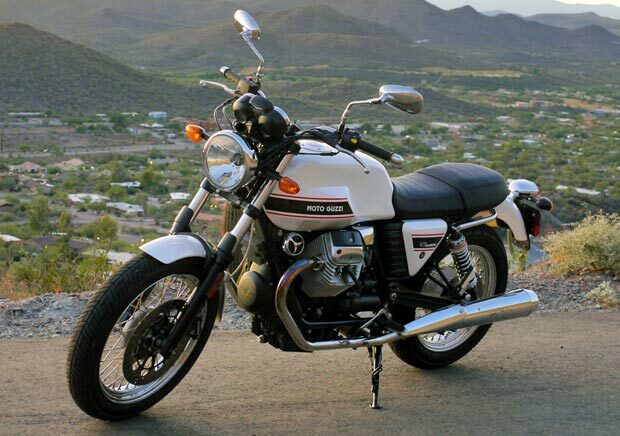 Fortunately, this particular Goose is anything but sanitized and has plenty of character to constantly remind you its from the motorcycle-obsessed country shaped like a boot. 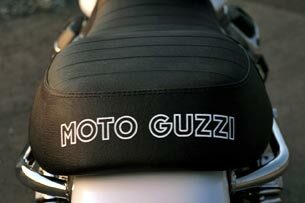 Take a good look at the Guzzi's long, flat, pleated bench seat. Cop a squat... it's comfy. 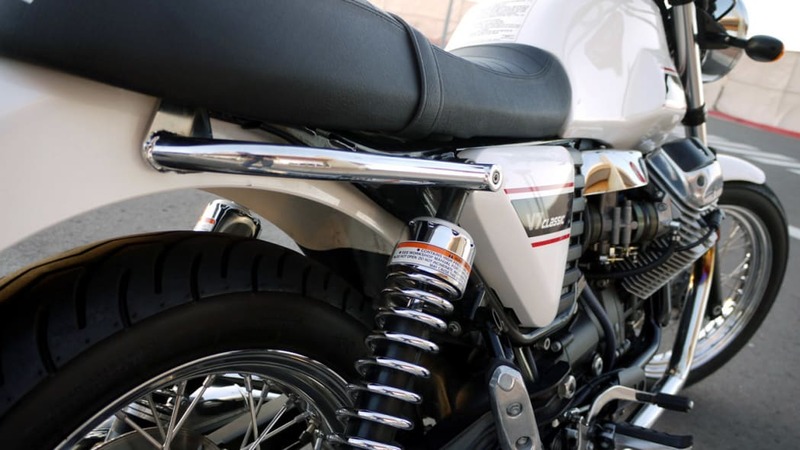 The reach to the chrome handlebar combined with the footpegs' position directly below the rider's posterior provide a perfectly neutral riding position. 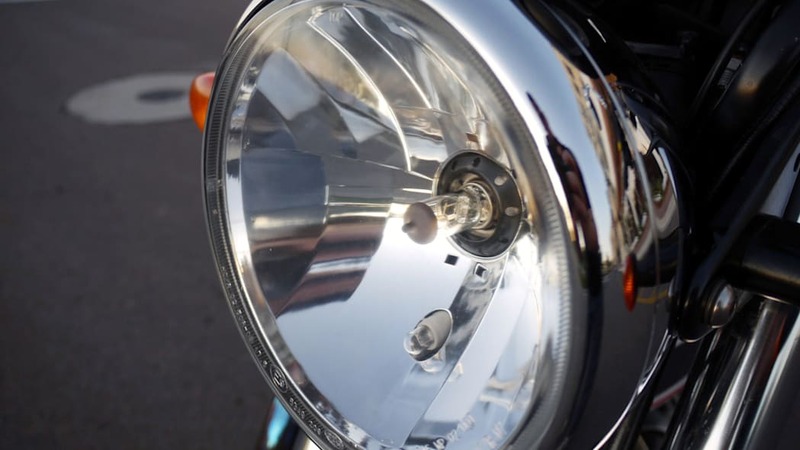 Look ahead at the twin chrome pods housing the white-on-black speedometer and tachometer and pay special attention to the cluster of dummy lights nestled in between. 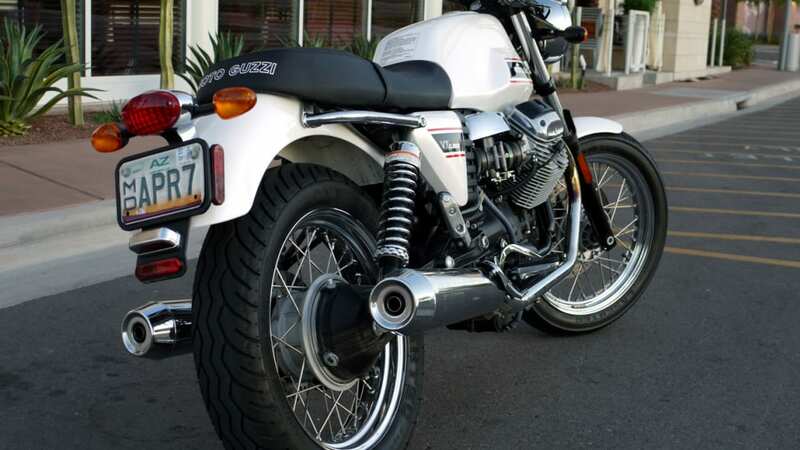 This is a very pretty bike, and we think it's particularly fetching in pearl white – the only color available for 2009. 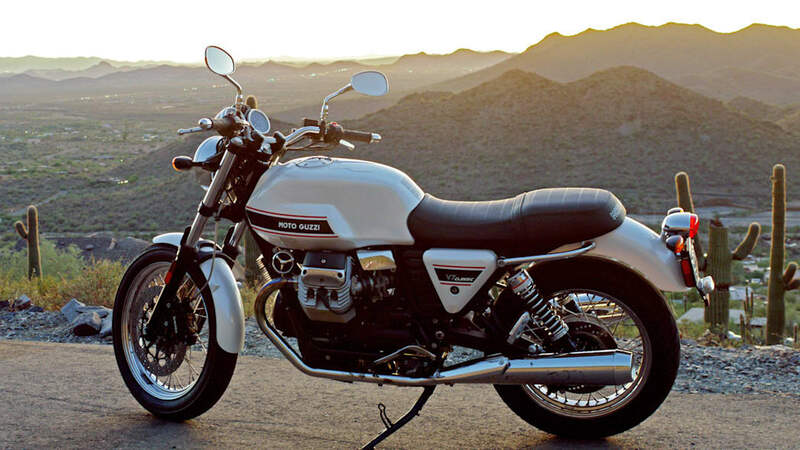 While Guzzi's new V7 borrows its name from a highly successful and memorable series of motorcycles from the Italian brand back in the '60s and '70s, today's model isn't designed as a true sporting mount. 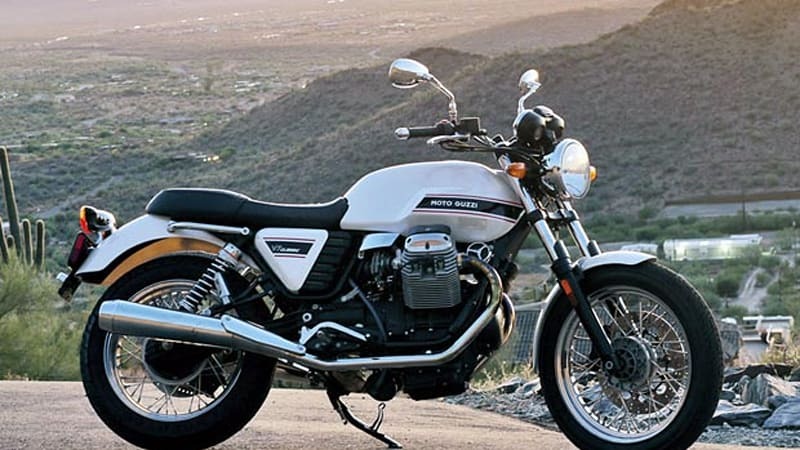 Yes, the V7 inherits the classic across-the-frame 90-degree V-twin engine configuration and shaft drive of the Guzzis of yore, and it keeps the dual rear shocks and conventional front forks of past models, but the bike's character is completely redefined. 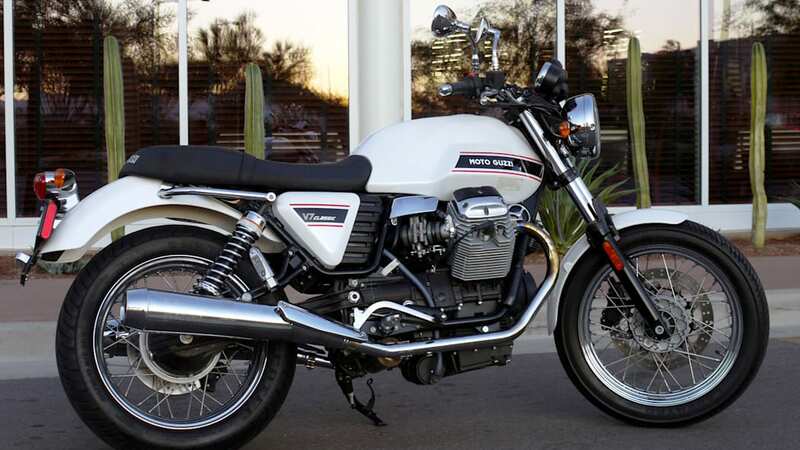 With the 2009 V7 Classic, Moto Guzzi has created a relaxed motorcycle that's comfortable and sedate, and the bike's relatively low center of gravity makes it an attractive mount for beginning or returning riders or just about anyone that's not interested in scraping pegs at every opportunity. 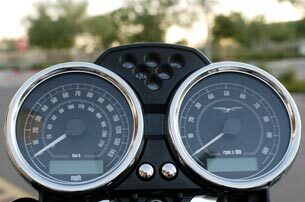 Steering geometry is set up for stability, not quick handling, and that suits the Classic's demeanor just fine. 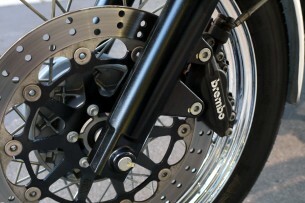 Damping from the suspension bits at both ends is adequate, and the twin Sachs pogo-sticks out back sport adjustable spring preload. Up front, the 40-millimeter Marzocchi forks do their best Jacques Cousteau impression under heavy braking, but offer a comfortable and composed ride everywhere else. 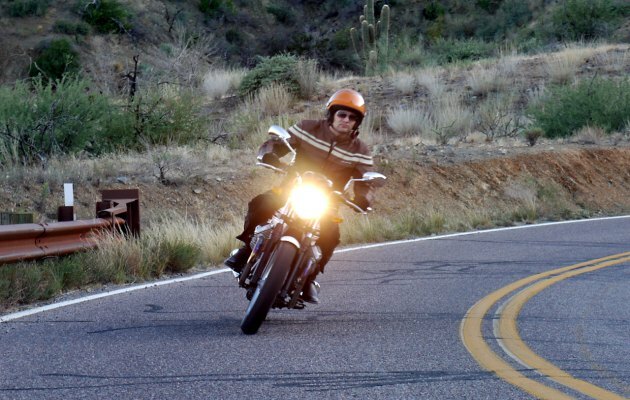 We found that handling was completely adequate for the bike's intended mission, but nobody will mistake the Classic for a canyon carver. Dial back the speed a bit and the mildly flexible chassis doesn't feel so noticeable. Enter a corner with a bit too much speed, though, and be ready for a somewhat disconcerting wallow that erodes confidence with quickness. 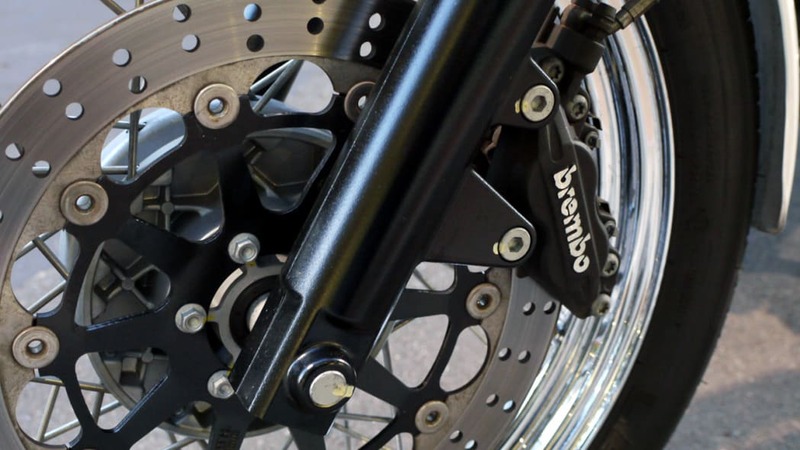 Similarly, the bike's single 320 millimeter front and 260 millimeter rear disk brakes offer plenty of stopping power when the bike is ridden within its admittedly mild limits. We noticed that the rear wheel proved surprisingly easy to lock up when braking into turns, but that proved easy enough to deal with once we slowed the pace a bit. 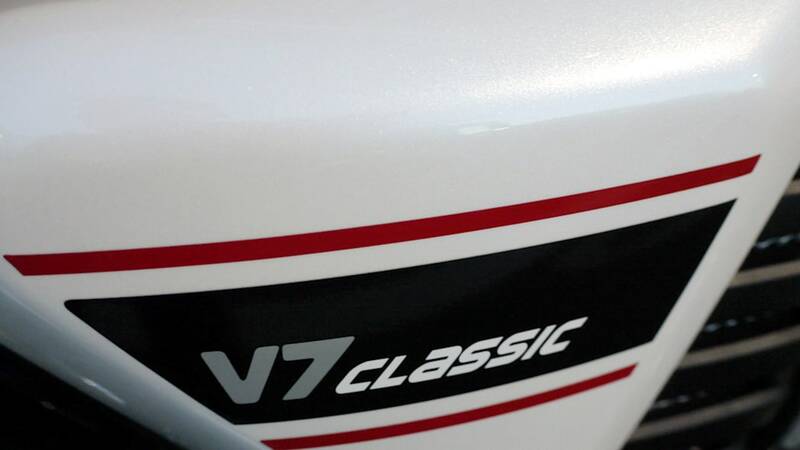 Under normal riding conditions through the city or on the highway, any deficiencies of the brakes or suspension become immaterial and the V7's character begins to shine. Every piece feels just right and we found it extremely easy to run through an entire tank of gas with nary a concern in the world. Enjoy the sights and the sounds, stop and smell the roses... then refill the tank and do it all over again. 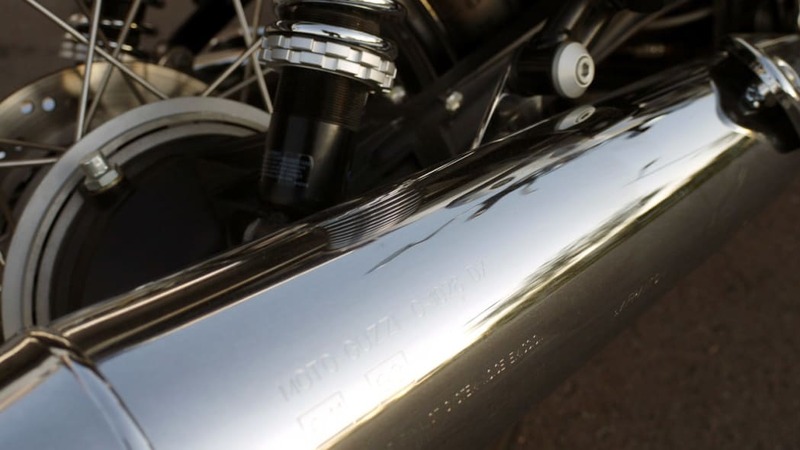 Power from the air-cooled and fuel-injected 744 cc V-twin tops at a reported 48 horsepower at 6,800 RPM, which isn't a whole heck of a lot... but that figure doesn't tell the whole story. 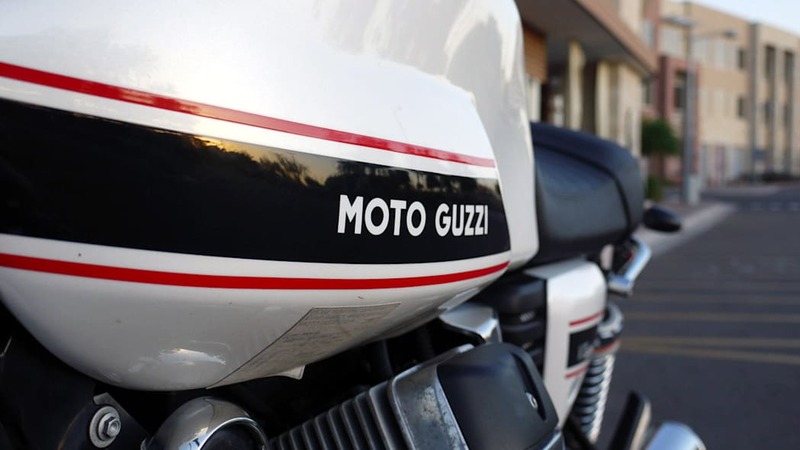 In reality, there's enough wild horses running deep inside the Guzzi's longitudinal crankshaft to scoot away from stoplights at a respectable clip – beating traffic off the line won't be a problem unless you're lined up against something awfully exotic or another bike. 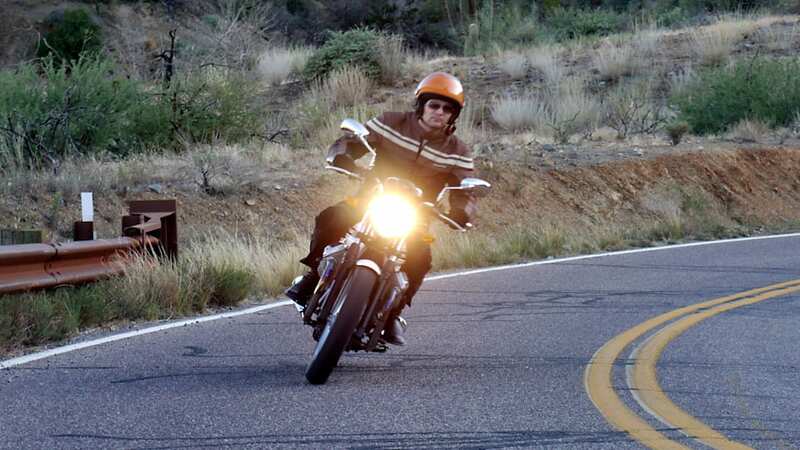 Keep the throttle pinned and the Classic will eventually do the ton, but don't expect much more than that. 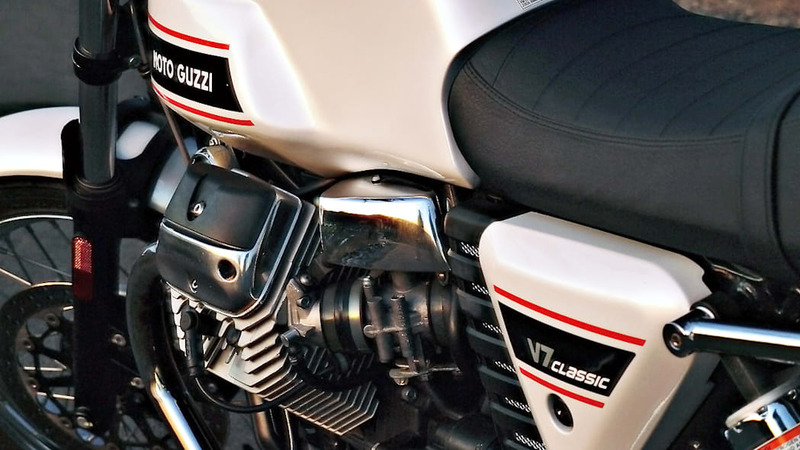 We're not sure where Moto Guzzi officially sets the V7's redline (it's not marked on the tach), but it doesn't really matter. There's no good reason to rev the powerplant past 7,000 RPM as power drops off precipitously and the vibrations begin to bother. There's plenty of torque right off idle and the engine pulls smoothly from about 2,000 RPM. A deliberate press is required to move the gearbox from one cog to another, but the act of changing gears takes place with a highly reassuring click. 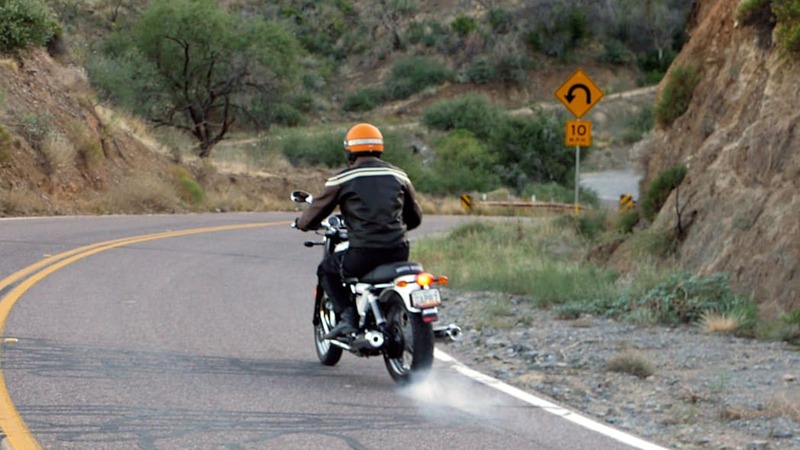 Clutch action is commendably light and the bike starts moving just as soon as you release pressure from your left grip. 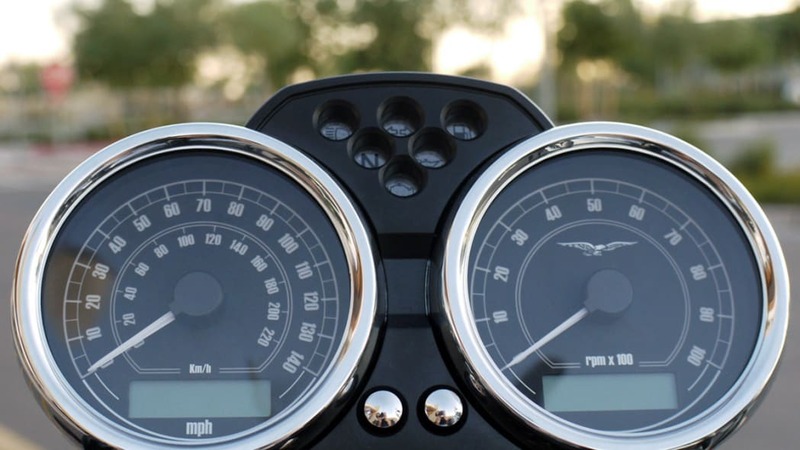 Listen carefully as the tach passes 3,000 RPM and you're in for a treat. 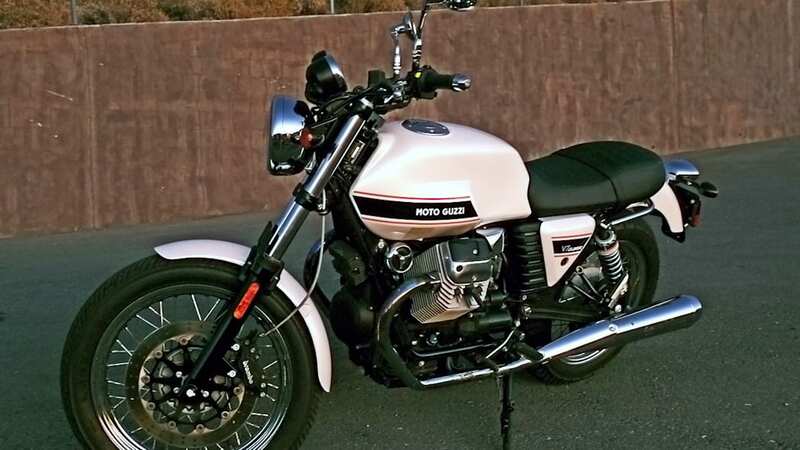 We think this Guzzi is best enjoyed with an open-face helmet so the rider can pay attention to the thumping beat of the small-bore twin at cruising speed. Direct your ears at the spinning lump between the frame rails and you'll hear plenty of agricultural sounds ticking contentedly away, but the exhaust note is wonderful. 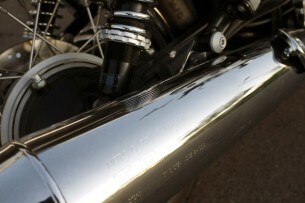 If we were to put a V7 Classic in our own garage, the baffles inside the twin chrome megaphones might just meet their demise via the blunt business end of our favorite ball peen. Sure, we'd prefer it if all that beautiful Italian music translated into additional forward progress, but that's not what this bike is all about. Oh, and in case you're wondering, there's just enough ponies to bring the front wheel up... not that we really recommend it. 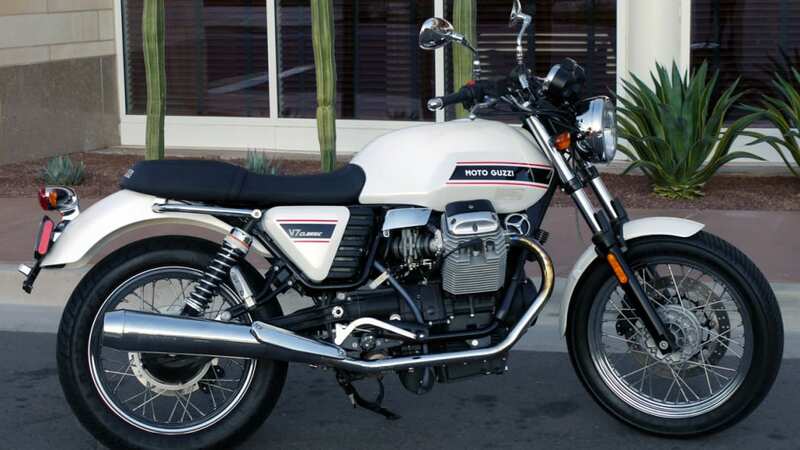 Compared to the reborn Triumph Bonneville – the Classic's most natural competitor – the Guzzi is down on power and costs a few hundred bucks extra. 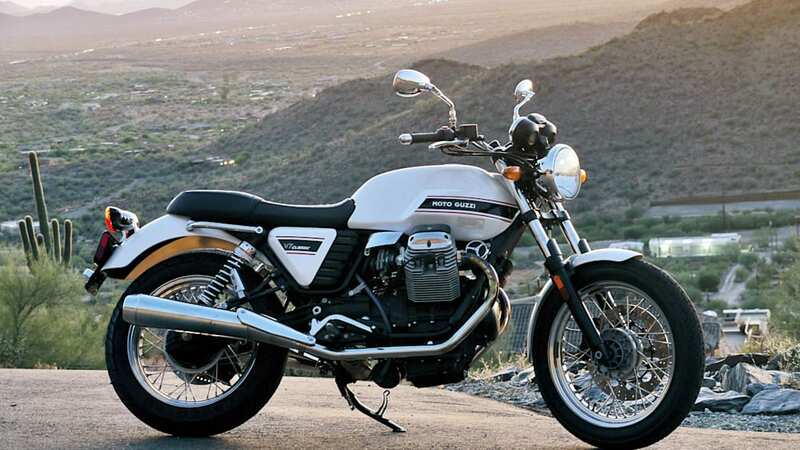 On the other hand, the V7 is also lighter than its British foe, has loads of style and you're not likely to see another one every time you go for a ride. We also got plenty of thumbs-up while thumping our way through the busy urban streets in Phoenix, Arizona. And that's got to be worth something, right? 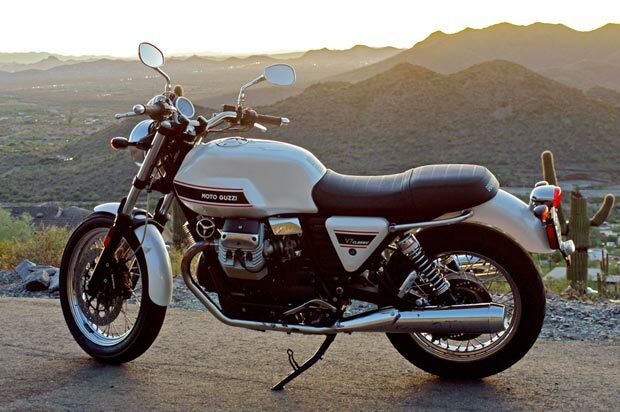 With the V7 Classic, Moto Guzzi may have created the most Italian UJM ever. A contradiction in terms? Yep, but that's how we see it. Power? Enough. Handling? Competent. Comfortable? Without question. Attractive? 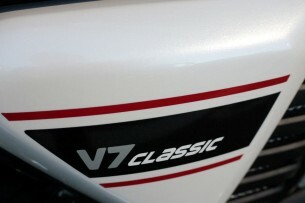 Well, beauty is in the eye of the beholder and all that, but yes, the V7 Classic is a looker. 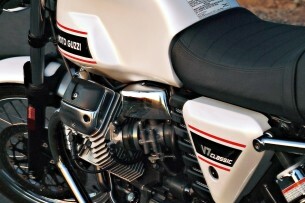 Added to all that is the Guzzi's commendable fuel economy, returning nearly 50 MPG during our tests. All in all, this Italian Goose is a modern take on a proven concept and made for relaxing. No surprise... we knew that the first time we laid eyes on it.